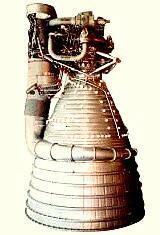 Rocketdyne LOx/Kerosene rocket engine design of 1968. Improved version of the F-1, which would have been used in any follow-on production of Saturn launch vehicles. Designed for booster applications. Gas generator, pump-fed. Status: Study 1968. Date: 1967. Thrust: 9,189.60 kN (2,065,904 lbf). Unfuelled mass: 8,098 kg (17,853 lb). Specific impulse: 310 s. Specific impulse sea level: 270 s. Burn time: 158 s. Height: 5.48 m (17.97 ft). Diameter: 3.61 m (11.84 ft). Thrust (sl): 8,003.800 kN (1,799,326 lbf). Thrust (sl): 816,178 kgf. Engine: 8,098 kg (17,853 lb). Chamber Pressure: 70.00 bar. Area Ratio: 16. Propellant Formulation: Lox/RP-1. Thrust to Weight Ratio: 115.71. Country: USA. 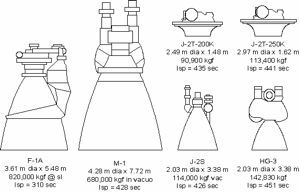 Launch Vehicles: Nova GD-B, Nova MM 1B, Nova MM 1C, Saturn MLV-V-1, Saturn MLV-V-2, Saturn MLV-V-3, Saturn MLV-V-1/J-2T/200K, Saturn MLV-V-1/J-2T/250K, Saturn V-24(L), Saturn MLV-V-4(S)-B, Saturn V-25(S)B, Saturn V-3B, Saturn V-4X(U), Saturn V-25(S)U. Propellants: Lox/Kerosene. Stages: Nova GD-B-1, Nova MM 1B-1, Nova MM 1C-1, Saturn MS-IC-1, Saturn MS-IC-3B, Saturn MS-IC-25(S). Agency: Rocketdyne.